Rabat – Following King Mohammed VI’s meeting with South African president Jacob Zuma, in Abidjan, Ivory Coast, the 75-year-old president expressed wishes to re-establish diplomatic ties between the two countries. A photo featuring an iconic handshake between the two heads of state bodes well for their respective countries’ economic and diplomatic ties after a 13-year hiatus. However, the diplomatic U-turn is far from eliciting unanimity among the African National Congress (ANC), the leading party chaired by Zuma. 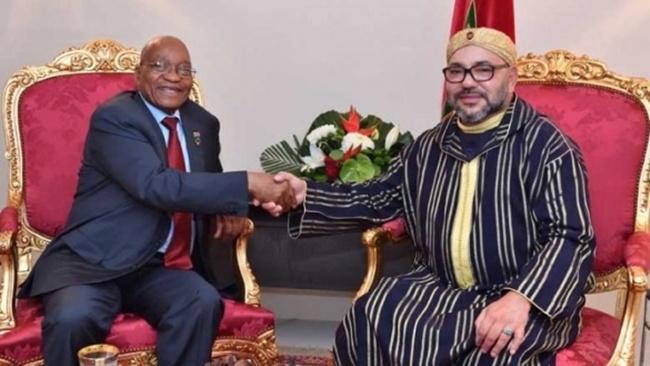 While the move is unanimously praised as a diplomatic triumph by the Moroccan media, the South African political landscape remains divided about re-opening ties with Morocco. The issue dividing the ANC is its longtime non-recognition of the Western Sahara as a Moroccan territory. The party has made its unwavering support for the self-proclaimed Sahrawi Arab Democratic Republic the linchpin of its African diplomacy. Earlier this year, the ANC scathingly criticized the African Union for readmitting Morocco after it left the organization 30 years ago, deeming it as an attempt to “sweep under the carpet” the independence of the Western Sahara. Back in 2004, Morocco withdrew its ambassador from Pretoria, South Africa’s administrative capital, in response to the policies of the former South African president, Thabo Mbeki, and his support for the independence of Western Sahara from the kingdom. Morocco’s “empty chair policy” continued for over 13 years, until 2016, when Abdelkader Ansari was appointed at ambassador level in Pretoria, the South African capital. The African Union-European Union Summit held in Abidjan came as game changer in the troubled history between Morocco and South Africa. While the Moroccan media anticipated the speech of King Mohammed VI on the issue of the migrants stranded in Libya, a sudden turn of events blazed the African political scene. Camera lenses captured Morocco and South Africa respective heads of state sitting together, smiles wide in a warm handshake. Moroccan media outlets labelled the gesture as a victory for the country’s diplomacy over Polisario’s strong allies. “The two heads of state had a cordial and honest meeting, and agreed to work hand in hand for a better future, as Morocco and South Africa represent two poles for political stability and development in the continent,” reads the Moroccan royal cabinet’s press release, featuring a photo of the handshake. The two countries are now to appoint ambassadors in Pretoria and Rabat, Morocco’s capital, in order “to engage in political and economic partnership [and] to sustain and strengthen the ties in order to surpass the severed ties for decades,” according to the statement. According to Molewa, there is no African National Congress policy that says South Africa is an enemy of Morocco or does not speak to Morocco. However, the party played a crucial role in opposing Morocco’s return to the African Union. In an official statement, the African National Congress expressed its “unequivocal support” for Western Sahara, but without burning bridges entirely with Morocco. A New Era for the ‘Frenemies’? Were the two countries really on hiatus? According to Khalid Chegraoui, professor and expert in African affairs, the academic partnership is still going, as he personally visited several South African universities. In a statement he gave to Akhbar Alyaoum, Chegraoui said that Zuma’s stances on the Western Sahara do not stem out of personal opinions or bias, but rather a matter of interests. If Zuma’s changing interests lined up with Morocco’s agenda, the latter should scale down its optimism. The ANC chairman, who narrowly survived a no-confidence vote in the South African parliament, faces growing criticism for criminal allegations, as leaked documents have revealed his ties to the Guptas, a family of business tycoons that orbits in his circle. In addition, Zuma is left with only two years of reign, while he will continue to chair the African National Congress for the next few weeks. The politics governing the relationship between Rabat and Pretoria will greatly depend on the chairman the ruling party will elect, as it is he or she who will very likely to run for presidency.